This page is a "Latest news" archive ... news that is no longer "new," but still relevant. Any news that is posted on the homepage will eventually land here. Please visit the Homepage for the latest and most current news! Current events, CD releases, ongoing projects and more! Visit TV4U to see music videos that Ron produced for the Legends Live CD series a few years ago - including two Cufflinks videos featuring Ron himself! Just click on the image of the artist whose videos you want to watch. An article on Mediasound Studios in a recent issue of Mix Magazine features some comments from Ron, along with a photo of him with Pat Benatar. To read the article online, visit this page. October 2005 - Ron Dante was interviewed by The Washington Times for a writeup on bubblegum music - click here to read it! Check out photos of Ron Dante taken at his July 2nd private performance in Yorba Linda, CA! Check out photos from Ron's appearance at the Cannery Casino in Las Vegas during Memorial Day weekend! Now available - The Essential Barry Manilow, a 2-CD set featuring more than 30 tracks, many of which were produced by Ron! Click here for ordering info. Click to see photos from Ron's appearance at the Aronoff Center in Cincinnati, Ohio! A few years ago, Ron was featured on an episode of Dr. Phil along with the parents of a talented 13-year-old boy, Barry, whose parents want him to become the next Barry Manilow. For a detailed summary of the segment complete with screenshots, go to this page on Dr. Phil's official site, then click on the link entitled "How can Barry fit in?" A new window will pop up; use the arrows to advance through the pages. You can also purchase transcripts/videos of the show via the appropriate link on Dr. Phil's homepage. Check out the December 2004 writeup in the Las Vegas Sun about Barry Manilow ... Ron is quoted heavily throughout the piece! Check out Ron's phone interview of 12/02/2004 with Vegas Buzz! The interview is archived on their site; just click on the link to listen. To access my Webshots community, which features all my photo albums of Ron Dante concert pix, click here. Two writeups on Ron Dante hit the Internet within days of each other. The first one, an interview conducted by AM Radio Gold, can be found on the All But Forgotten Oldies site. The second is a piece written by yours truly, entitled "Ron Dante Remembers The Sixties," presented by Spectropop. Enjoy! 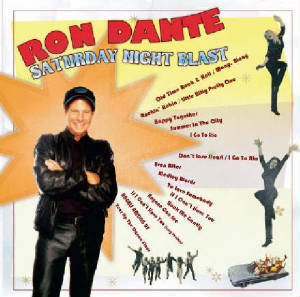 Ron Dante's CD, Saturday Night Blast, has been getting rave reviews! To listen to an audio sample of one of the tracks, Ron's beautiful version of "Angels Among Us," click here. For details on how to pick up a copy, click on the cover image below. Are you a member of Ron's official mailing list? If not, now's a great time to join! Click on the link or use the graphic below to sign up. Check out the photos from Ron's appearance with Andy Kim at the Riviera Hotel, Las Vegas, on September 6, 2003! An article I wrote on Ron Dante, entitled Then and Now: A Ron Dante Restrospective, appears on the Spectropop site -- click to access it. Check out Twenty Questions: Ron Dante in his Own Words on this site. Below are links to purchase various products (CD's, videos, etc.) which feature Ron. To buy Ron's own CD's, both solo and with other groups/artists, visit this page. Ultimate Manilow features 20 of Barry's hits from the 1970's, the golden greats recorded under the Dante-Manilow partnership. Click on the graphic above and listen to some sound samples, and while you're there you may as well place the CD in your shopping cart because you're gonna want it! The Essential Barry Manilow - 2-CD set, a 2005 release featuring 34 tracks including many produced by Ron. A MUST for the diehard fan! Barry Manilow's CD, "Here at the Mayflower," features Ron Dante singing on three tracks -- "Turn the Radio Up;" "They Dance;" and "Welcome Home." To listen to sound clips and order a copy, just click on the pic! The PBS special "Chapel of Love: Jeff Barry and Friends" is available as a home video, on both VHS and DVD formats. Here's your chance to see Ron Dante perform on stage! Ron did two songs for the show. To order a copy, just click on the pic above (for VHS) or below (DVD). The 2000 PBS Special "Chapel of Love: Jeff Barry and Friends" is also available on audio CD. The CD features two tracks by Ron; for the entire track listing, scroll down to the description of the video. To order your copy of the CD, just click on the pic. If you don't already own this wonderful video, why not purchase both at the same time? Because once you have one, you'll want the other! The progeny of Scram Magazine and Feral House, Bubblegum Music is the Naked Truth is edited by Kim Cooper and David Smay and features interviews with Ron Dante and Jeff Barry as well as articles on Toni Wine, The Archies, and The Cuff Links. A wealth of info for Ron Dante fans everywhere! Writers include Bill Pitzonka (who did the liners for the Varese Sarabande bubblegum comps) and Carl Cafarelli (who wrote the first major bubblegum history for Goldmine several years ago). Click on the pic above to buy a copy!